While the presumably dreadful “it” referred to in the opening verse of “It Could Happen to You,” one of my favorite jazz standards, is nothing more than the dangerous but blissful plight of falling in love, a late 17th-century French print recently acquired by the Getty Research Institute posits the same “it” as much, much worse—in fact, as potentially life-threatening. Significantly larger and of a more refined finish than most moralizing or humorous popular prints of the period, this luxurious and skillfully engraved image was meant to be admired and examined at length, perhaps inspiring piquant conversation. At first glance, the print seems to offer a variation on a theme perennially revived in European prints from the mid–1400s on: the lampooning of a mismatched couple. 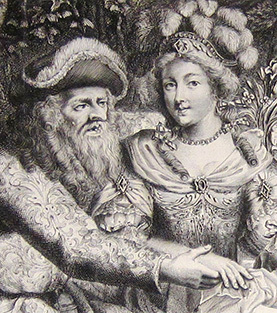 An old man practically drools over the poised and sumptuously attired young woman at his side, awkwardly embracing her and clutching a bouquet of flowers. He even clumsily attempts to engage her in a bit of footsie, resting his club-like clog atop her dainty slipper. 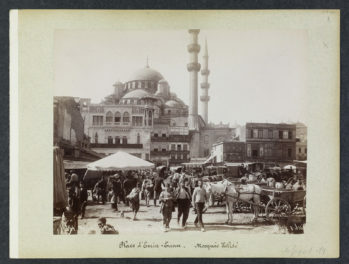 Meanwhile, a bespectacled monkey picks the old man’s pocket, and captions throughout the print drive home just how ancient this eager lover is: he has one foot in the grave; he and the candle in the foreground are both nearing their ends; he is likened to the broken vase in the lower right; and most ominously, his tomb waits ready in the background. The woman gazes directly at the viewer, and in addition to her yards upon yards of bejeweled silk brocade, lace, feathers, and even ermine fur, she wears an expression of cool amusement. While we might think that she has agreed to be with this old man for his money, the text below quotes her telling him to, essentially, get lost; he’s wasting his time. The loyal dog that barks in aggravation clearly objects to the match, while the cat at the woman’s feet appears to be growing increasingly annoyed at the situation, foreshadowing a less than happy future for such a couple. The old man (labeled slightly derogatorily as “un viellard”) and the young woman (“la damoiselle”) are only two actors in a scene that becomes more beguiling the closer one looks. Off to the right a young man slumps against a tree. His lute has tumbled to the ground, silenced by an arrow puncturing his chest. Cupid runs off nearby, leading one to wonder whether the young man was struck with love for the woman and, misreading her intentions with regard to the old man, subsequently died of a broken heart. It’s murkier than this, however. 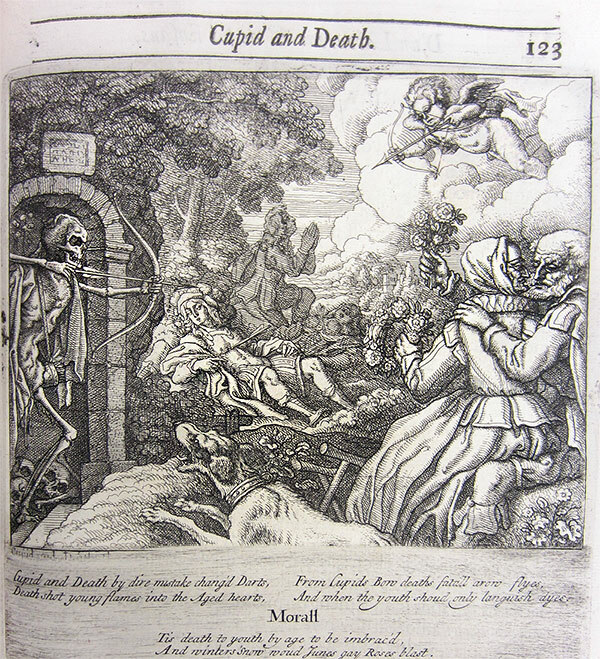 Cupid actually appears in the print twice; in the background, he appears to sleep by the old man’s tomb. Another character hides in the bushes behind the old man. Somewhat camouflaged, Death, in the form of a skeleton, wields a bow. Has he shot the young man in a bid to undermine Cupid? Or has his arrow missed the more obvious target, the old man, and hit the young man accidentally? Contemporary audiences wouldn’t have had to ask so many questions. 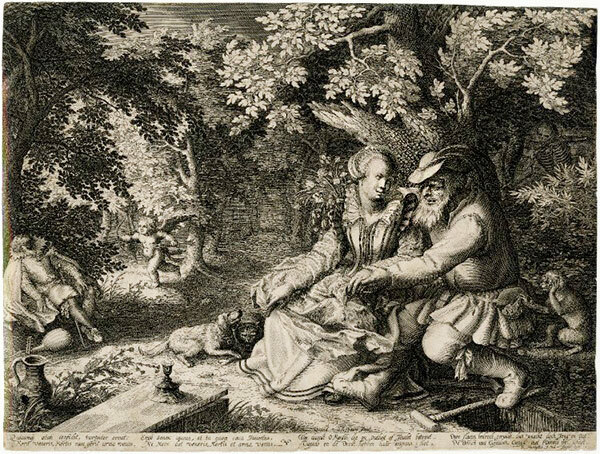 Not only was this print based on existing images in wide circulation (the engraver changed little from an earlier Dutch version other than substituting the latest in Parisian fashions), but it also riffs on a well-known moral tale from Aesop’s fables. The story “Death and Cupid” tells is of a world made chaotic through the inadvertent swapping of Death’s and Cupid’s arrows. While some variations locate the mix-up in a tavern where Death and Cupid have both overindulged, others have Cupid fall asleep in Death’s cave, where, upon waking, he spills his arrows, thus mixing them with some of Death’s that are scattered on the cave’s floor. As a result, Death’s targets fall in love rather than falling over dead. Soldiers on a battlefield dance and sing, while old people receive the equivalent of a shot of Viagra. Alternatively, the young, meant to be in their romantic prime, are killed by the deadly arrows Cupid sends flying. And winters’ snow would Junes gay Roses blast. 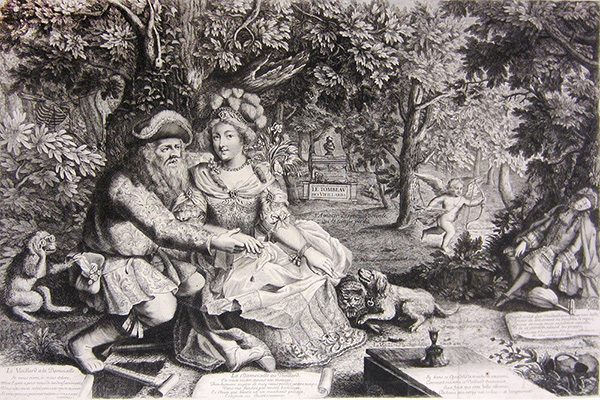 The anonymous 17th-century print that accompanies the verse pairs two elderly lovers rather than an old man and young woman; was the woman a “gay Rose” before succumbing to the icy breath of this old man? Does the couple in the Research Institute print represent a similar pairing, with “old man winter” on the left, and on the right a spring rose that, like the man’s bouquet of flowers, refuses to wilt? 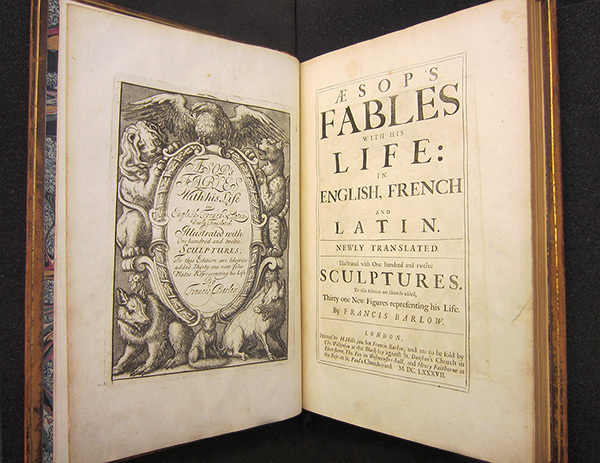 The story seemed to enjoy a renewed popularity during the 17th century, and was most notably adapted into a masque thrown by Oliver Cromwell in 1653 for a Portuguese ambassador. In this version, composed by James Shirley, the chamberlain of the inn where Death and Cupid drink switches the two’s arrows in order to get revenge on Love for his own wife’s being a “hard-hearted baggage.” The trick backfires when Death shoots him with one of Cupid’s arrows and he falls in love with two apes. The Research Institute’s new take on this story is an incredibly rare print, though its publisher Pierre Landry (who may also have engraved the image) offered it in both small and larger, more luxurious sizes like our impression, which measures 1.5 feet tall and over 2 feet wide. I'm a research assistant in the Collection Development department of the Getty Research Institute. 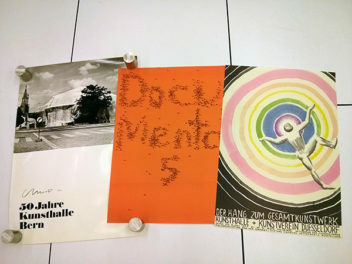 My job allows me to work on a wide array of projects including exhibitions, acquisitions, setting up presentations in Special Collections, and assisting with curators' research projects. I find working with prints especially rewarding because these ephemerally inclined objects can range from the masterfully artistic to the fascinatingly amateurish. I moved west in 2009 to study art history at the University of California, Riverside, where I completed my MA in 2011.